Born: ? ? 1781 / 82 ? Buried at: Parramatta Anglican Cemetery ( St John’s Cemetery ), O’Connell St, Parramatta. On 1 April, 1819 Constable Cosgrove came upon three men, Timothy Buckley, David Brown and Timothy Ford, and believing them to be bushrangers approached them and enquired where they were heading. The three men suddenly took to their heels, so Constable Cosgrove announced his office and called on them to stop. Buckley then turned around and fired a shot at the constable from the musket he was carrying. Constable Cosgrove returned fire almost simultaneously with his pistol. Unfortunately the musket shot had struck the constable, causing a fatal wound. The Sydney Gazette and New South Wales Advertiser dated Saturday 10 April, 1819 reported on the trial of three offenders charged with the constable’s murder. Wednesday.-This was a day of serious trial for the murder of William Cosgrove, a settler and district constable upon the Banks of the South Creek, on the 1st of the present month; by the discharge of the contents of a musket loaded with slugs into his body, of which wounds he died the following day. The prisoners were Timothy Buckley, by whom the gun was fired; David Brown, and Timothy Ford, all of whom had been in the Colony but six or seven months, and prisoners in the immediate employ of Government, and who unhappily had not renounced those propensities which sooner or later were to lead them to an unhappy end. [One] witness declared himself the brother of the deceased; and in the sympathetic feeling of humanity, received from the Judge Advocate the following much to be remembered sentence of condolence. “Witness, you have done your duty to Society; you have acted well in the performance of that duty, and the world has much to regret that you have paid so dearly for it, in the loss of a brother, and of a good member of Society.” The unhappy men were yesterday executed. The constable arrived in Australia as a transported convict on the vessel Rolla in 1803. He was granted his Certificate of Freedom in 1810. The Colonial Secretary’s Letters of 30 April, 1820 names his replacement at South Creek as Constable William Hill. 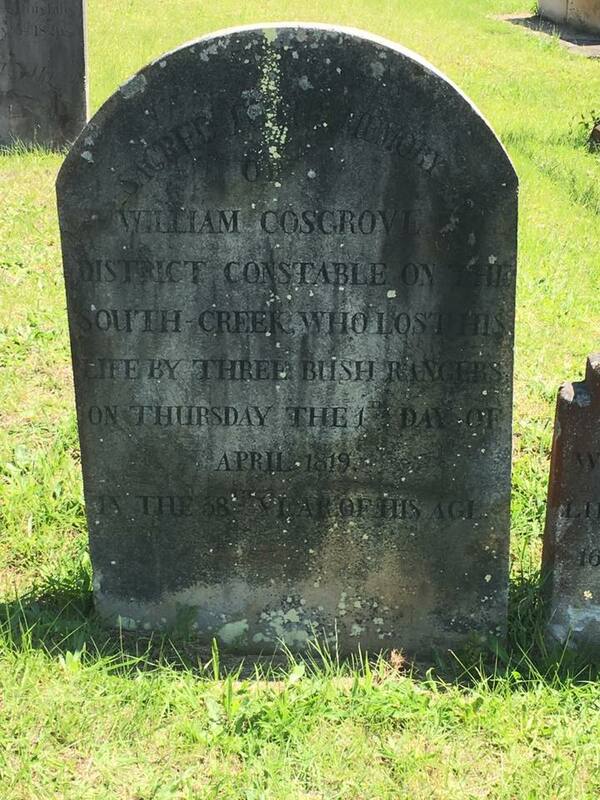 At the time of his death the constable was the District Constable of South Creek (now Parramatta) and was previously the Constable and Pound Keeper at Bringelly and Cooke. WEDNESDAY.-This was a day of serious trial for the murder of William Cosgrove, a settler and district constable upon the Banks of the South Creek, on the 1st of the present month ; by the discharge of the contents of a musket loaded with slugs into his body, of which wounds he died the following day. The prisoners were Timothy Buckley, by whom the gun was fired ; David Brown, and Timothy Ford, all of whom had been in the Colony but six or seven months, and prisoners in the immediate employ of Government, and who unhappily had not renounced those propensities which sooner or later were to lead them to an unhappy end. The first witness called was Thomas Cosgrove, brother of the deceased, whose testimony was conclusive of the fact. This witness stated, that his murdered brother was a district constable at the South Creek; and that he having seen, and believing the three prisoners at the bar to be bush-rangers, requested him, the witness, to join in pursuit of the suspected persons; all which was readily complied with, and a pursuit accordingly commenced. This was about one in the afternoon ; the deceased went up to the three men (the prisoners at the bar), and found them in conversation with two young men who were brothers of the name of York, one of them a son-in-law of the deceased. The deceased called to the prisoners at the bar, declaring his willingness to point them out the road to the place they were enquiring for, namely the ” Five mile Farm ;” but appearing conscious that they were armed bush-rangers, he hesitated not to require their giving themselves up to him, he being a district constable. This evidence further proved that the prisoners at the bar were in conversation with the two Yorks for many minutes prior to the pursuit which was proposed and persevered in by all the persons who joined in it by the manly boldness of the district constable, who, although a man in good circumstances, had reconciled the apprehension of danger with his manifest line of duty. This witness, who seemed in his evidence to entertain no sort of feeling that could be construed into a vindictive sentiment, went further on to state, that one of the Yorks, the eldest, had joined in the pursuit ; that his murdered brother had repeatedly required the three fugitives to surrender themselves ; that Timothy Buckley, who had the musket, turned round repeatedly and levelled at them ; that one of the fugitives, Ford, had attempted to wrest the piece from him, but did not succeed ; that the pursuers behaved themselves with great courage and with the most determined zeal in apprehending these three stoutmen, one of whom was armed with a gun, and appeared only to await the moment of murder until the difference of celerity in his pursuers should mark the most needful object. Brown, who was the taller and most powerful of the three, turned several times upon Buckley, who had the gun, and told him to keep a good look out on such a man, meaning the man who was closest in pursuit, and this was the deceased ; who was armed with a pistol, but did not discharge it until after he had received the contents of the musket into his side, breast, and lungs, the charge consisting of eleven or twelve slugs; his pistol afterwards went off, . but hurt nobody. Stricken with death, the poor man then sat down on a bank; was taken home; and lived in anguish until the following day. This witness declared himself the brother of the deceased ; and in the sympathetic feeling of humanity, received from the Judge Advocate the following much to be remembered sentence of condolance. “Witness, you have done your duty to Society ; you have acted well in the performance of that duty , and the world has much to regret that you have paid so dearly for it, in the loss of a brother, and of a good member of Society.” Cornelins Ryan sworn.- Witness went last Thursday to the house of the deceased to get some wheat ground at his steel mill ; and prior to any other communication the deceased asked him if he had seen, three men of suspicious appearance, whom he considered to be bush-rangers; to which he answered affirmatively, and consented to go with the deceased, whom he knew to be the constable of the district, in pursuit of the run-aways; that the three men, now the three prisoners at the bar, were enquiring of the two Yorks the right road to the Five mile Farm; and the deceased telling them he would show them the right path, they all ran off; on their doing which the deceased ordered them to deliver themselves up to him, as he was the district constable ; that they nevertheless continued to run ; the man (Buckley ) who was armed with the gun, repeatedly turning round, and presenting it at the nearest of his pursuers ; that the deceased was armed with a pistol, which went off on the instant after the explosion of the musket, the contents of which lodged in his body. Other witnesses gave evidence to the same effect, proving the murder in the clearest possible manner; and also that the whole three of the prisoners at the bar were actuated by the self-same spirit of hostility, determining on the taking of life rather than surrendering themselves to justice. The evidence being too clear to admit of a defence, the prisoners when called upon acknowledged being together on the unhappy occasion, Brown and Ford making no further observation than that the gun was in the hands of Buckley, from whom Ford would have wrested it, as appeared by the testimony of Thomas Cosgrove ; but no conception could be entertained that his endeavour so to wrest it was well intentioned ; and with respect to Brown, every witness had sworn that when the three were running from their pursuers, he said repeatedly to Buckley, ” don’t fire until there is occasion.” He stated upon the contrary that his expression had not been until there is occasion, but that his actual expression had been, ” do not fire, for there is no occasion.” Every witness had distinctly sworn to the expression with which he had been challenged, ” do not fire until there is occasion for it;” and he became of course a principal in the murder. Timothy Ford, a very young man, apparently not exceeding two or three and twenty years of age, was placed on the right hand of Buckley, who was in the center ; and from every appearance seemed to have reconciled himself to an unavoidable destiny. The hour of trial and the hour of death are so closely connected in the case of murder, that this unhappy creature had death precisely in his view, and as much as animated nature would afford, he might be esteemed the appearance of a moving corpse. The unhappy men upon each side of him defended themselves upon the principle that they could not prevent the firing; but why they, would the voice of reason say, associate with a man whom they could not control, bind, or manage, armed with a loaded gun, and conscious of a punishment resulting to all connected with him for any crime he should himself commit. The only doubt, His Honor observed, was whether the Court was in the possibility of discerning between the unfortunate men at the bar any difference or distinction of crime. That there was only one musket was an established fact ; and that this one musket was the identically presumed defence of all, not mattering in whose particular hand it was, circumstances had sufficiently shewn. The only point upon which the Court could doubt of an equal criminality was, whether there might not have been in the course of the transaction a forbearance, a kindness which even in the criminal would be looked at by his judges with regard; but here nothing of the kind appeared. The man who fired the gun there could be no doubt respecting; but it was the entire wish of the Court to discover if possible a difference in the degree of guilt between the prisoners. One man endeavoured to wrest the musket out of the hands of the actual murderer ; and it is only presumable that if he had got possession of it, he would have committed identically the murder commited by his companion. The man, Brown, had repeatedly desired Buckley, by whom the piece was eventually discharged, not to fire until it was necessary. In the terms until it was necessary there was a tendency to murder. The investigation had been long and patient ; and for what reason? not to pass a verdict for a murder which was clear in its proof, but to consider whether either or both of the accompanying persons were guilty as principals or as merely accessaries, the Court considering that its judgment would be final, and establishing its verdict upon proofs which left no doubt behind them. Men meeting and combining in an illegal pursuit, what mattered it of what cast or colour their pursuit might be, they were all equally liable to every danger that might accrue therefrom ; and here were three men, escapers from their Government employ, travelling from place to place with a loaded gun ; a gun loaded with eleven or twelve slugs ; the whole of which were deposited in the body of a man whose duty it was to apprehend them, and who in the mild performance of his duty was horribly murdered. Brown had said that his words were not ” do not fire until there is occasion, but that his expression was, ” do not fire, for there is no occasion.” In this turn of expression there is a strong difference ; but the entire weight of evidence is against him. The Court has been particular upon the point, and every witness has sworn particularly to the expression which brings this prisoner to the crime of murder as its immediate instrument & adviser. You heard the unhappy man who was murdered among you say that he was a district constable ; you also heard him require you to give yourselves up to him ; you, Brown and Ford, it is melancholy to remark, saw repeatedly the prisoner Buckley turning round and levelling his piece at his pursuers ; and at length you heard the explosion ; one of you, that is Timothy Ford, having repeatedly told the actual murderer Buckley to keep a strict eye upon his nearest pursuers ; having also endeavoured to wrest the gun away from the man who had it, how was it possible to say for what purpose ; the whole of his conduct was against the slightest sentiment in favour of him. His Honor the Judge of the Court went to considerable length in the retrospection of an evidence which admitted, not of contradiction ; and performed the painful duty of passing sentence of condemnation with that degree of energetic sympathy which has ever distinguished him as a Gentleman of feeling. Two other unhappy criminals, John Green and John Brennan, received sentence of death at the same time, for the crime of breaking into a dwelling house in the day time, and nearly murdering its occupier. They were condemned with the others, under the dreadful stipulation that they might a few days outlive the persons with whom they were at the same time sentenced. Williams “possible” daughter – Mary Ann COSGROVE – died 20 May 1857 is also in Portion 1 of the same cemetery. Williams “possible” wife – Mary CROOKS – died 16 September 1842, aged 74, is also in Portion 1 of the same cemetery.